Charlotte Elliott’s family was preparing for the worst. She had a temperature above 40 degrees, a heart rate at 145 beats per minute and was in agony as the flesh of her leg was slowly eaten away. But if you wind back the clock one week, the La Trobe University student couldn’t contain her excitement. 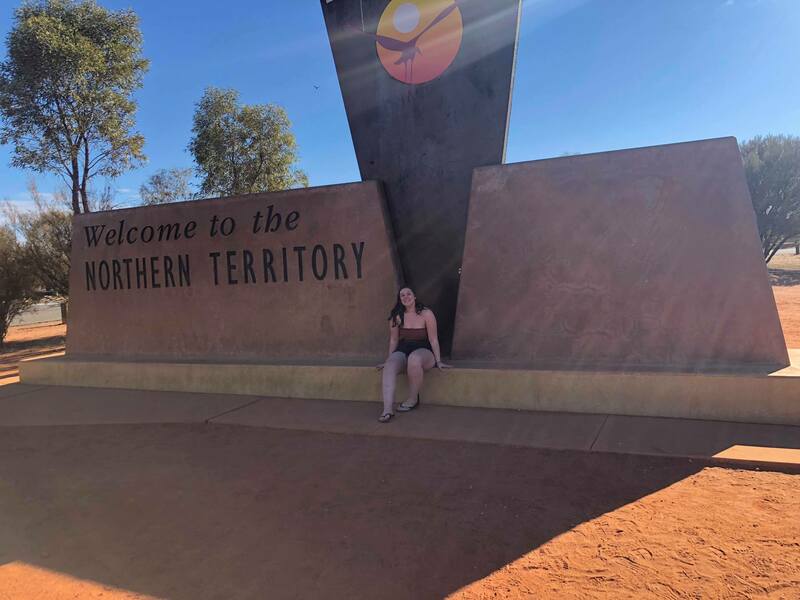 She and her sister Grace spent a year planning a trip to the Northern Territory, her mid-year exam was over, and she had a 1995 Ford Falcon panel van to take them on the adventure. “We were just going to the NT and we were just going to drive up until we ran out of money and time,” Elliot said. They met up with a friend at Alice Springs and did what most do on a Saturday night. “We met lots of people, we had lots of fun, had lots of drinks,” she said. When they returned to camp, the sisters realised they forgot the key pass to the caravan park, so they climbed the fence. On the way down, a wire pierced 10 centimetres into Charlotte’s thigh, leaving her hanging. Her drunkenness masked the pain as Grace pushed her up off the fence. One ambulance ride, four stitches and a tetanus shot later, the traveller thought she was good to go, and the next morning’s dizziness was just a bad hangover. “… I had to sit down three times in a dirty caravan park shower because I was so dizzy,” she said. Elliot was experiencing the symptoms of necrotising fasciitis, a flesh-eating bug which enters the body through cuts. The disease is both limb and life-threatening. “I was really dizzy, I was really nauseous, and I could hardly walk, my leg was really painful and really swollen,” she said. Two days later and unaware of the infection, the sisters drove to Daly Waters, spending the evening partying at its famous pub. The next day, Elliot could barely walk and had to convince Grace to bypass Mataranka – an iconic country town known for its tropical thermal springs – and take her to Katherine Hospital. “Once we got to Katherine Hospital … I couldn’t walk, I was just pulling my leg behind me and once I got in there, I fainted in the hallway,” she said. By 8pm the next night, the swelling and pain in her leg increased, and within a few hours, she was flown to Darwin. Charlotte underwent daily surgeries for the first five days to remove the infected flesh in her thigh, but the side effects of the painkillers meant she had no idea how life-threatening it was. “I didn’t really understand at the time, but a surgeon did say to me in my last few weeks: ‘you’re so lucky that you’re still alive and that you still have your leg and that you still have all your reproductive system,’ Elliot said. The surgeon told Charlotte the infection came within centimetres from ruining her reproductive system, which would’ve prevented her from having children. “At the time though I didn’t realise … I think because my brain was quite fuzzy,” she said. The student’s family kept the truth from her, however her mother Tracy was mortified when her daughter made a seemingly innocent joke while feeling groggy from painkillers. Charlotte underwent 17 surgeries in 52 days to remove the resurfacing infection, take skin grafts and change vacuum dressings. She was in excruciating pain, as even a blanket placed on her leg felt unbearable. The only way to remove the infection was to continuously cut away infected or dead muscle which eventually led to almost all of her inner thigh being removed. The nurses ensured Elliot was comfortable, giving her bed baths during the 69-day stint where she didn’t shower. Her surgeon gave her a beer at 7am for her twentieth birthday, while another surgeon let her family stay at their house during the tough days. The kindness of the Darwin Hospital staff made Elliot actually begin to enjoy going into surgery. “Surgery was almost like fun because it passed five hours of my day and I’d go down into the waiting bay and chat to all the anesthetists who I knew really well by then,” she said. Before surgery, her surgeons would play her favourite music until she fell asleep and the nurses chatted her through recovery. “I was very lucky, I had really amazing nurses in ICU [intensive care unit] and the ward. It was like having a circle of friends which I think when you’re in that mental state and physical state it’s really important to have that around you,” Elliot said. A Go Fund Me page was started by friends back home and La Trobe’s Menzies College held fundraisers for Charlotte, which she was incredibly grateful for. Initially, the money went towards flights, accommodation and a rental car so Tracy could support her daughter in Darwin. The remaining money will go to future occupational therapy appointments, pressure garments and reconstructive surgery to support the leg where adductor muscles were removed. Elliot hopes this will make her scar look more normal. “I find it really hard to look at my leg and look at the scarring and all of that… it gets you quite upset,” she said. Alexia Mitchell is a second-year Media and Communications (Sport Journalism) student. You can follow her on Twitter @lexilegs99. Photo: supplied by Charlotte Elliot.